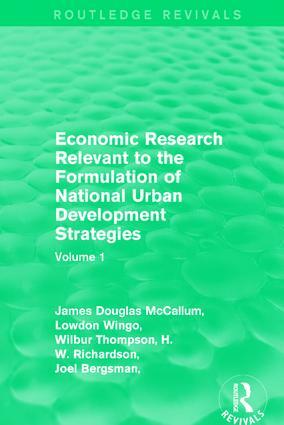 Originally published in 1971, this volume contains papers invited for a conference on economic research relevant to national urban development held in September of the same year. The conference pulled together researchers from both the United Kingdom and the United States who were interested in economic research on key issues of both countries’ management of their urban areas. Papers are varied from those in the early stages of research to those whose research has been completed and all provide an insight into the increase of urbanisation present in the first world. This title will be of interest to students of environmental studies and economics.